Yesterday my friend Adrian mentioned this cute little NAS device, the NSLU2 from Linksys. Yesterday my friend Adrian mentioned this cute little NAS device, the NSLU2 from Linksys. He seemed really excited about the fact that it used Linux as its operating system and there was an open source project called Unslung which provides replacement firmware for it. The replacement firmware allows using the unit as you would any regular computer running Linux. Needless to say, Adrian’s excitement rubbed off on me so I ordered 2 of them, one for work and one for home. At $AUD 159.00 each they are simply a steal. Two hours later, the NSLU2 at work was on the network serving files from a 200 GB disk. Samba and nfs were used serve files out to Linux, Mac OS X, Irix , Solaris and Windows computers. Apart from that I am also able to ssh into it and use it as any regular Linux computer. 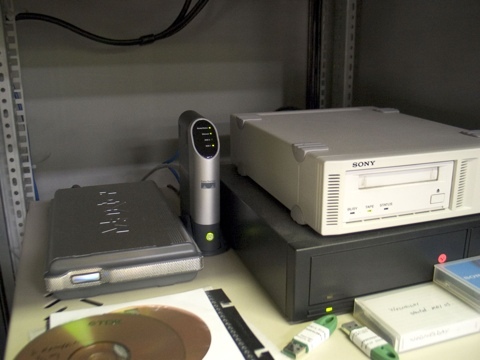 The picture above shows the NSLU2 in the rack sandwiched between a Maxtor drive (which is plugged into it) on he left and a Sony DDS4 tape drive + SCSI disk on the right. The 2 green things in front of it are USB dongles and 2 DDS4 tapes are visible in front of the black SCSI disk. The unit is unbelievably tiny. A big thank you goes out to the guys at the Unslung project. This is definitely the coolest Linux computer I have owned. Can’t wait to get home and set one up as an iTunes server for my 2 macs. Update, 28 June 2005: The home NSLU2 is all configured. It is a dns, nfs, syslog, ntp and itunes server for my home network as well as an ssh server providing access to my network while I am on the road. Since its gone live on the internet, a few people have tried to break in but the NSLU2 valiantly repelled all attacks.